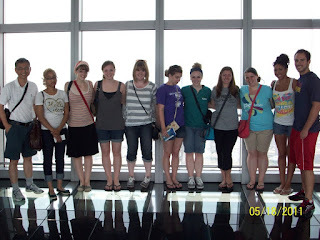 Today our day began with a visit the Shanghai Financial Center, which is the third largest building in the world. We quickly entered in at the lowest level of the building and then surged to the 97th floor; it only took 66 seconds to get there. It was impressive to review the history of infrastructures in Shanghai, which appeared during the 1990’s. The Shanghai Financial Center was build in 2005 and finished by 2008.The day was full of the elaborate Chinese restaurants, by which we were greet by all throughout the trip. Dinner was even more special because the Ming Yuan Restaurant topped all the eating centers that we had been to, and we were joined by the lovely girls from the Helena’s House of Hope. I got to eat bachoi, one of my favorite Chinese vegetables; then we said our goodbyes to our new acquaintances, accompanied by the ironic thought, that we would probably never see them again. My final thought was, “Its okay, the girls will be forever in my prayers.” The night ended with a final meeting that addressed cross-cultural diversi between the U.S. and China and preparation for our journey back to United States.